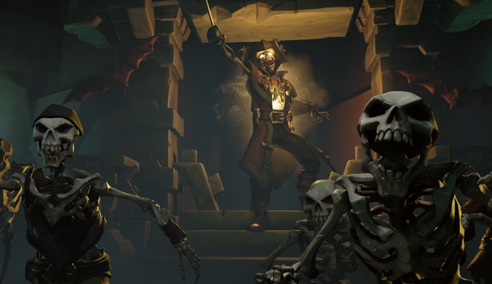 In Sea of Thieves, Skeleton Forts will occasionally take over one of the nine different Forts within the game. You will know that there is a Skeleton Fort occupying a regular fort simply by a Skull Cloud appearing in the sky, one directly over the fort it has taken over. While a Skeleton Fort is active, hordes of skeletons will be found throughout it, ones looking for a fight. If you can survive and defeat the skeletons occupying the space (as well as thieving players), you will earn a vast number of riches. The first step towards defeating a Skeleton Fort lies in merely reaching the island the fort is one. As you approach Skeleton Fort, your Ship will be shot at with cannonballs from the fort, ones being manned by some of the ghostly skeletons. Skeletons are pretty accurate when it comes to firing Cannons, so you will have to think fast in order to reach the island before you ship is completely ruined. One approach is to rush head on towards the island, hopefully your ship staying in tack long enough for you to do so. The other is to slowly but surely make your way towards the island, dodging as many of the cannonballs as you possible can before doing so. After reaching the island, you will then have to battle waves of skeletons containing anywhere from 10-15 skeleton each. Once one wave of these skeletons have been defeated, you will proceed immediately to the next one. There will be many different variations of skeletons apart of these waves - including Regular Skeletons, Plant Skeletons, Shadow Skeletons, and Golden Skeletons - but each wave will only contain one variation of such. While you slowly but surely making your way through the masses of skeletons, keep an eye out for any kegs of gunpowder. When shot, these babies will explode, possibly taking out loads of skeletons all at once. You can even try luring skeletons back on the bay of the island, which would allow you to use the Cannons on your Ship to fire at them. After defeating every last wave of skeletons, you will then proceed to facing the Skeleton Captain. Unfortunately, you won't be battle him alone, as he will have more of his skeleton army help him in hopes of defeating you. However, should you defeat the Skeleton Captain, the raid will instantly end and all other skeletons will parish along with him. Once the Skeleton Fort has been defeated, you will obtain a Fortress Key that will unlock the green door below the main fort building, one that will lead you straight to vast treasure of riches. You may think the battle is over now that the Skeleton Fort has been defeated; however, this is where the true test actually begins. You see, after the Skeleton Fort has been vanquished, the Skull Cloud in the sky will disappear. Some players will intentionally wait until a Skeleton Fort has been destroyed, attempting to steal the treasure from the pirates that did all the hard work. If this begins to happen for you - which it most likely will - grab the Cannons within the fort with some of your crew members in order to blast at opposing enemy ships. While doing this, have your other crew members make off with the treasures to your Ship. 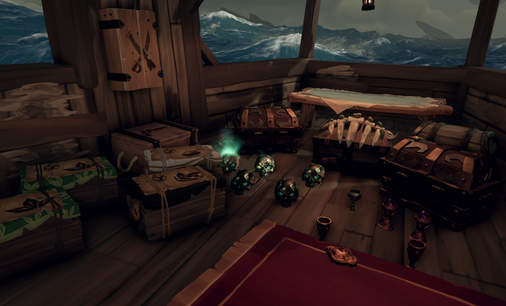 If you're lucky enough to hold the thieving pirates off long enough to make off with all of the treasure on your own, head immediately to the nearest Outpost to cash it in. If you begin to get chased by others on your way to the Outpost, try you best to lost them. if you can't, head straight to the nearest Outpost instead. 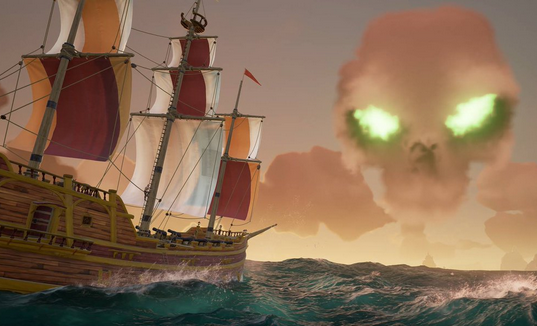 if you are sailing on a Galleon with other members, you should be able to have half of your crew fight off enemy ships after anchoring while the other half cash in the treasure.